As the final pre-season games conclude and the NFL season is about to begin, Intertops Sportsbook has posted odds favoring the Indianapolis Colts (+800) over last season’s champions the New Orleans Saints (+900) to take the coveted Vince Lombardi Trophy. To add to the fall football festivities every dollar wagered on NFL games at Intertops Sportsbook (beginning September 9th and throughout the NFL season) earns one entry in a free contest that will see one lucky player win a luxury trip to Texas to experience the excitement of Super Bowl XLV first hand. For those whose crystal ball doesn’t look quite that far into the future, Intertops is offering a weekly Free Pool Competition. Throughout the NFL regular season players that correctly predict the winners of the week’s action will get tokens worth up to $100. 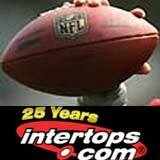 Intertops took the first online sports bet ever, fourteen years ago, and is still one of the most popular and trusted online sportsbooks around the world. From the beginning it’s been famous for specializing in US major league sports. The comprehensive sportsbook offers a full range of NFL betting propositions including special group bets on which team from a group of five Contenders (Baltimore, New England, New York Jets, Atlanta, San Francisco), Pretenders (New York Giants, Pittsburgh, Miami, Houston, Philadelphia) Hopefuls (Cincinnati, Tennessee, Arizona, Washington, Denver) and Hopeless (Seattle, Carolina, Jacksonville, Kansas, Oakland) will have the most regular season wins. The Colts (+400) are favoured over the San Diego Chargers (+500) and the New England Patriots (+600) to win the AFC Championship game. For the NFC Championship, Intertops likes New Orleans (+450) over the Dallas Cowboys (+500) and Green Bay Packers (+550). The NFL season kicks off September 9th in New Orleans as the Saints meet the Minnesota Vikings. Super Bowl XLV will be played on February 6, 2011 pitting the champions of the AFC and the NFC against each other. The game will be held at Cowboys Stadium in Arlington, Texas. This will be only the third time it will be held in Texas. All new customers at Intertops receive a 25% bonus on their first deposit. Beginning today and throughout the NFL season opener weekend (ending September 12th), everyone can receive another 20% deposit (up to $100). Details are on the Special Offers tab at www.Intertops.com/sportsbook. All NFL odds quoted are as of today and are subject to change.